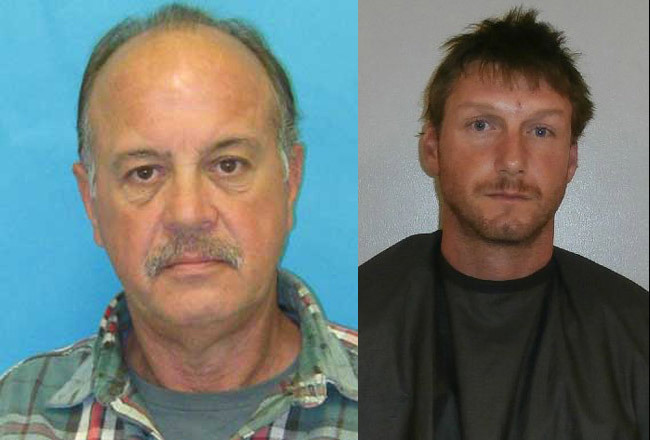 Jody Medders, left, in his Florida state prison mugshot, and Edmond Nathaniel Welch, both of whom were arrested subsequent to a home invasion early Saturday morning in Bunnell. Two men are at the Flagler County jail this morning in connection with a home invasion that took place before 2 a.m. Saturday. It’s not clear if the suspects have a connection to the home invasion in Bunnell the previous night. Between 1:30 and 2 this morning, there was a knock at the door of Ray Mercer’s home at 410 North Anderson Street in Bunnell. Mercer answered. A man asked to use the phone. When Mercer went to retrieve it, the man broke through the door and attacked Mercer, who is in his 80s. The man wore a black scarf to dissimulate part of his face, and was with two other men, who then proceeded to rob Mercer of various possessions, possibly including a firearm. It was the second home invasion in Bunnell in two days. Thursday night, Richard Allen Pettit, a 60-year-old resident of 164 Espanola Road in Bunnell, was attacked and robbed of several firearms and cash by four men, one of whom, Pettit said, wore a scarf around his face. Pettit, who is disabled, was thrown from his wheelchair and injured. Mercer sustained injuries to his arms. Mercer told police that he recognized one of his assailants. He identified him as Jody Medders, a 55-year-old felon last sentenced to two years’ probation in March, for possession of a controlled substance. Medders has served three stints in state prison since 1981, including a 42-month sentence for aggravated assault on a a police officer or other first responders, fleeing and eluding police, and resisting arrest. Bunnell police and Flagler County Sheriff’s units swarmed down on Bunnell after the alleged home invasion. Medders was found walking in the Red Gator restaurant parking lot. He was arrested and charged, but not with a home invasion. He was charged with probation violation and possession of a firearm or ammunition by a convicted felon. He is at the Flagler County jail on $5,000 bond. A second suspect, Edmon N. Welch, was pursued on foot and arrested, and charged with home invasion robbery, battery on a person older than 65, petit theft and possession of a controlled substance. He is at the Flagler County jail on $27,000 bond. Welch served 15 months in state prison after he was sentenced on charges of threatening harm and battery in August 2011. He’s been booked at the Flagler jail eight previous times before this morning on charges including probation violation, domestic violence battery, burglary, assault, and corruption by threat. Can the State of Florida Department of Corrections please keep this one for good this time? Good thing Mercer had a gun to protect himself with. Medders, 55? Time to throw away the key. At 55, people usually grow out of crime. Glad Ray is O K, seems like its starting to get really bad around here anymore!!!!! they dont need addiction help. its beyond that at this point. they need to be put away where they cant do this to innocent poeple anymore. this state is too easy on “addicts” with long wrap sheets… put them away for good!! My husband and I have known Jodie almost all his life. I just have to say that the attack on Mr. Mercer, whom most of us know very well, is unconscionable. Apparently all those times spent behind bars didn’t seem to help Jodie much. Our thoughts and prayers are with Mr. Mercer. As for Jodie, he’s going to reap what he sows. Such a sad and sorry world. Have you seen Jody Medders’ DOC jacket? Pls, if Kim Hammond would have sentenced him according to guidelines just say the last three times he was in front of him….he would still be an inmate!! He was just arrested in Flagler Beach in October and I don’t know how that was disposed of but ummmmm, well…..if they don’t get it right this time then the system is DUMB! Saw the older guy yesterday hitching a ride from Daytona north. He does need to be locked up for good this time. Actually they both do!!! Its time to “LOCK AND LOAD” folks, the days of Wine and Roses are over in this formerly peaceful County. we need you back on the job Bub!!!!!!!! WE miss you. Mr mercer is a great and caring man anyone that would hurt and older person or any person needs to stay in prison sorry but at 55 your not getting better. I’m not going to say what these men need because I know go will have the final say in there destiny. Just a very sad thing and to happen in so often in our once peaceful town it’s scary to even go to the store at night or day anymore something has to be done. Can I use your phone? That’s one of the oldest trick to get into a home..
We’re living in a rotten time where it’s hard to trust anyone, so don’t. sad thing is mr. mercer has known jody his whole life! Wasn’t Mr Mercer our postmaster for many yrs?? Drugs has always been JM’s crime motivation and always will be!! LOCK HIM UP!!!!! DILLIGAF You could not have said it better. “Bub Robson” was to law enforcement what “Dale Earnhardt” was to nascar. Nobody will ever fill their shoes. Alot of the stuff going on now would not have taken place on “Bubs” watch. I hope you enjoy your retirement “Bub” because you have earned every minute of it many times over.